Today’s Feature Friday spotlights one of our retail partners in Washington, D.C.: Everett Hall Boutique. Everett Hall Boutique is a family business that opened in 1994. Everett Hall, the store’s namesake, has been recognized by GQ as one of “America’s hottest designers”. GQ also named Everett Hall Boutique “one of the most popular stores for celebrities”. Some of the shop’s famous customers include Nelson Mandela, Tyler Perry, Emmitt Smith, Charles Barkley, and Maury Povich. You can read more about Washington, D.C. here. It’s been said that you shouldn’t start a business with an idea. Instead, you should found a company because it offers a solution to a problem. Today we’re excited to introduce the person who envisioned what Dapper Classics could be before it even began – Harrison Rich, Our Co-Founder. In 2011, Harrison identified a problem that needed addressed. That problem was a lack of Made in USA options for fine men’s hosiery – namely, over-the-calf socks. Upon recognizing this problem – an apparent gap in the sock market – Harrison imagined a company that could be the solution. Working with Fred, his father, Harrison turned his vision into a reality – and thus, Dapper Classics was born. 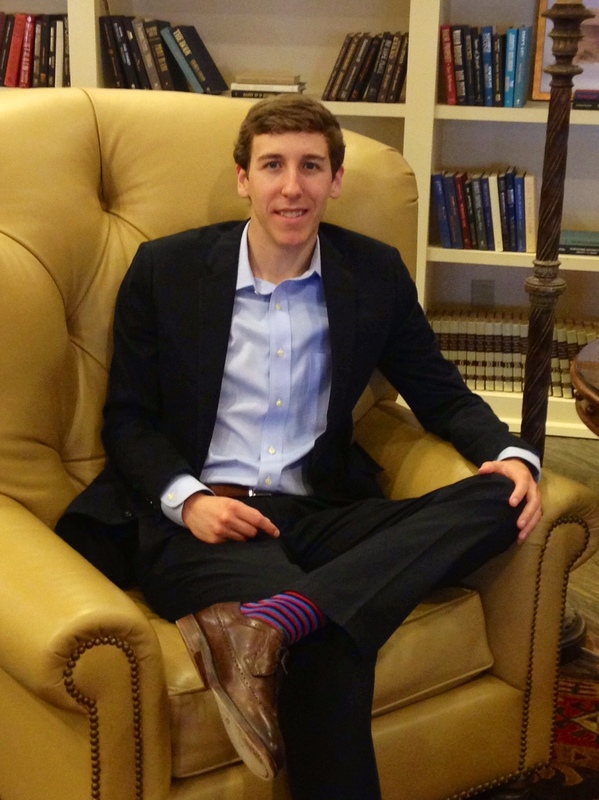 Harrison was instrumental in designing our inaugural line of socks and our original website. He continues to play an important role in product designs – offering fabric and style advice on our socks, neckties, and trousers. In his spare time, Harrison enjoys spending time with family and running. Today’s Feature Friday spotlights our first retail partner in Indiana: Andrew Davis. Andrew Davis Clothiers is located in Bloomington. The store carries a wide range of custom clothing, sportswear, and accessories. The shop is Bloomington’s top spot for formalwear and tuxedos for sale and rental. Andrew Davis is committed to offering the finest men’s clothing and to providing an equally great shopping experience. Bloomington is located in southern Indiana. According to tradition, settlers named the city after its impressive blooms. Bloomington is home to Indiana University. The city was the setting for the Academy Award-winning film Breaking Away. Facebook, Twitter, Instagram, Pinterest, Blogging – if you said these words not too long ago, people would’ve thought you were talking gibberish. But in today’s world, a strong social media presence is becoming increasingly crucial to a company’s success. Today we’re excited to introduce the person who posts, tweets, pins, and blogs for Dapper Classics – Dustin Wood, Our Social Media Director. Dustin is one of the founding members of Dapper Classics. He also happens to be our company president’s son-in-law. Dustin performs a variety of tasks for Dapper Classics – he works with our graphic designer on promotional materials, establishes connections with other companies, makes sales calls, and provides insight on product designs – but his primary responsibility is communicating with customers and potential customers via social media. Whether it’s sharing images from a men’s show or announcing new arrivals and special promotions, Dustin seeks to keep our followers up to speed on all things Dapper Classics. You can find out where to follow Dapper Classics on social media here. When Dustin isn’t behind his keyboard, he enjoys spending time with his family and watching sports. Today’s Featu re Friday spotlights one of our retail partners in Alabama: Remon’s, The Gentleman’s Clothier. The shop’s owner and namesake, Remon Danforah, started working in his grandfather’s tailor shop when he was just a child. Remon later opened his own alteration shop when he was still a teenager. He founded the Birmingham store, now in operation for over 30 years, a few years later. Remon has been in the menswear business for nearly his entire life, but he remains passionate about helping men achieve the perfect look. In 2012, Remon was recognized as “The Face of the Finest Men’s Clothing” in Birmingham. For more on Birmingham, read here. Those familiar with the Dapper Classics brand know the company was founded by father and son Fred and Harrison Rich. The Dapper Classics Team is comprised of other family members also. Today we’re pleased to introduce our Quality Assurance Specialist, Mark Rich – Fred’s brother. Mark performs a variety of important tasks, making him a key cog in the Dapper Classics machine. One of his primary responsibilities is inspecting products for quality. Put another way, Mark functions as a gatekeeper for our brand. At Dapper Classics, we like to say that “Dapper is in the Details.” Without Mark’s attention to detail in inspecting our products, this saying would mean nothing to our customers. We’re proud to support American jobs by only carrying clothing and accessories that are expertly made in the USA. Mark is the final check-point between these items and our valued customers. In addition to fulfilling his Quality Assurance Specialist responsibilities, Mark helps manage inventory and oversees our packaging and shipping department. When Mark isn’t working, he enjoys golfing and fishing.